Behavioral Scientists bring a unique tool in the assessment of individuals charged with executing an organization’s security mission. Preting employs leaders in the field of Behavioral and Operational Psychology to provide case file reviews, case consultations, assessment of individuals’ motivations and behaviors, management support for conflict resolution, and investigative and operational support for federal and commercial customers. Design Thinking and Business Modeling are just two of the many tools that Preting uses with clients to map out a company’s story. These tools help executives discover new business models, revise them to respond to changing conditions, and manage portfolios of distinct businesses within a large enterprise. We use customized facilitation methods to help business units and teams re-design their current models. 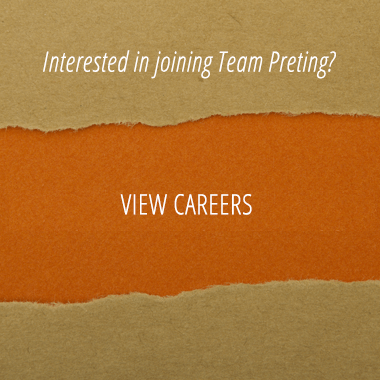 Preting offers a full range of training courses to educate clients. Much of our training is interactive with practical exercises and interactive learning methodologies. Business Design is a blueprint for a firm that shows interrelationships between the firm’s major processes and main resources required in achieving its objectives in providing value to its customers. Preting provides both training and operational support within the U.S. Government to Armed Forces, Law Enforcement and Intelligence Agencies. Our cadre of psychologists has the expertise, experience, and capability in behavioral science consultation services to successfully enhance an organization’s security initiatives. + Brings us together to support companies and causes that are positively impacting the world! For government clients and partners, Preting has past performance as a successful small business on numerous federal government contracts.